The Obama administration's policy banning references to "Islamic extremism" and "jihad" in discussions about terrorism drew criticism during last Thursday's House Homeland Security Committee hearing on the Boston Marathon bombings. The bombings "should again teach us that the enemy we face is violent Islamist extremism, not just al Qaida," said former U.S. Sen. Joe Lieberman. "Osama bin Laden is dead. And the remaining leadership of al Qaida is on the run, but the ideology of violent Islamist extremism is rapidly spreading." The Boston investigation already has shown that Tamerlan and Dzhokhar Tsarnaev "adopted the outrageously false narrative of violent Islamist extremism, that Islam and America are involved in a struggle to the death with each other," Lieberman said. It has been more than five years since the Department of Homeland Security, under the Bush administration, issued a directive about "the difficult terrain of terminology" as recommended by unidentified academics and Muslim American activists. "Jihadist" and "Islamist terrorist" were identified as terms to be avoided. Jihad "glamorizes terrorism, imbues terrorists with religious authority they do not have, and damages relations with Muslims around the globe," the memo said. By identifying them as mere extremists or criminals, they lose some of the luster that attracts recruits, the argument goes. Is it working? How can you tell? Anecdotally, this strategy did nothing to dissuade the Tsarnaevs, or any of the other homegrown terrorist plotters in recent years. The policy's effectiveness is difficult, if not impossible, to quantify. But skeptics, such as Monterey Terrorism Research and Education Program Director Jeffrey M. Bale, say the language policy is illogical. "Why, after all, would Muslims look to non-Muslims to interpret their religion for them, or for guidance about how to identify and label Islamists?" Bale said in response to an email from the Investigative Project on Terrorism. "Indeed, if we call jihadists 'criminals,' it may actually have the counterproductive effect of garnering more sympathy for them given the levels of anti-U.S. and anti-Western hostility throughout the Muslim world." Faisal Shahzad failed to set off the car bomb he built and parked near Times Square in 2010. But he said he tried to kill Americans because he saw himself as part of "the war against people who believe in the book of Allah and follow the commandments, so this is a war against Allah. So let's see how you can defeat your Creator, which you can never do. Therefore, the defeat of U.S. is imminent and will happen in the near future, inshallah [God willing], which will only give rise to much awaited Muslim caliphate, which is the only true world order." Farooque Ahmed similarly thought he was acting to defend Muslims when he plotted to attack subway stops along Washington's Metro. FBI agents were drawn to Ahmed after he tried to make contact with terrorist groups so he could wage jihad against Americans. At Ahmed's sentencing, public defender Kenneth Troccoli explained that Ahmed's extreme religious beliefs helped land him in front of the court. "First, there's an incessant message that is delivered by radical followers of Islam that one cannot be true to the faith unless they take action, including violent action, most especially violent action. And this is a message which of course the United States combats in many different fronts," Troccoli said. "But [it] is an incessant message nonetheless that for a person like Mr. Ahmed who is a believer in Islam and is a Muslim, he hears all the time that he is not -- not only is he not sufficient under the faith, if one were to believe these negative messages, but he's also not patriotic because he was born and raised until he was 16 in Pakistan." Ahmed bought the message offered by American-born al-Qaida cleric Anwar al-Awlaki, among others, that Muslims who do not wage jihad, "literally will not find salvation under their faith." The problem is especially acute for converts, a study by the Henry Jackson Society found. They were involved in nearly a quarter of the 171 al-Qaida related offenses in the United States since 1997. Zachary Chesser wanted to join the Somali terrorist group al-Shabaab not long after converting to Islam. Chesser is serving 25 years in prison for trying to provide material support to al-Shabaab and for his role in threatening the producers of "South Park" following an episode portraying the prophet Muhammad in a bear suit. The producers wanted to show that Islam is the only major religion which prompts violent reactions to any criticism or mockery. His case generated a bipartisan report on online radicalization by the Senate Homeland Security Committee. In a handwritten letter from prison, Chesser told committee staffers that, "My religion, the state of affairs in the Muslim world and a desire to alleviate suffering within it led me to desire to fight jihad." Muslims investigating their faith find two choices, he wrote, "do nothing and pray or fight jihad somewhere. Increasingly, 'somewhere' is here. One does not typically run across the fiqh [jurisprudence] of diplomacy and negotiations unless to go into great depth." "The one who sets out to learn inevitably sees jihad as viable and preferable at some point," Chesser wrote. Rather than merely ignoring Chesser's path to radicalization, and his language, a counter-narrative is needed to rebut the narrative put forth by al-Qaida, Awlaki and other religious scholars that are readily accessible on the Internet. There are heroic efforts made by individual Muslims. 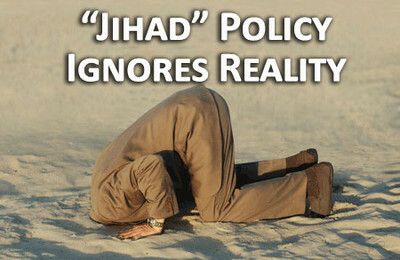 But it is here that the government policy, stoked by national Islamist groups (see sidebar), proves woefully misguided. During an appearance on CNN after the Marathon bombing, former radical Islamist Maajid Nawaz advocated "challenging the jihadist ideology, discrediting their propaganda." Ask someone to identify the symbols and leaders representing radical Islam, and "[y]ou'd think of the black flags, you'd think of the leaders such as bin Laden, Awlaki, Ayman Zawahiri. If I asked the same question for leaders and symbols of democratic activism in the Middle East today, we're much harder pressed to think of those leaders and symbols. And that tells us something about the power of the radical Islamist brand today versus the power of the democratic brand. And that's what we should really be focusing on." But you can't counter narratives when you refuse to acknowledge their existence. That's what the current policy does. In a separate CNN appearance, Nawaz said Muslim jihadists see America as the true enemy in a global war. "The younger [Tsarnaev] brother, let's remember, said in his interview that he was fighting on behalf of the Afghans and the Iraqis. He's probably never visited those two countries. Yet somehow, he felt that he owed more allegiance to Iraq and Afghanistan than to the very country that adopted him," Nawaz said. The American-Islamic Forum for Democracy has launched a Muslim Liberty Project aimed at promoting patriotism as compatible with faith, rather than promoting the notion of a universal "ummah," or Muslim nation. The 2008 DHS directive on language frowns upon use of the word "liberty," saying that "many around the world would discount the term as a buzzword for American hegemony. Forum founder Zuhdi Jasser said national Islamist groups have failed to lead on the issue. "And that many of the leadership in our community says, oh, there's no problem. These guys weren't even really Muslims. We don't have the narrative about victimization, America's biggest, America's anti-Muslim, anti-Islam, they're killing Muslims abroad. They're in Muslim lands," Jasser said. "This narrative is not balanced by other Muslim leaders, the reformists that are anti-Islamist that believe in American liberty, and that imbalance creates a narrative that makes them feel that this society is not theirs, that they're visitors." Jasser is a devout Muslim working to elbow his way into the discussion about Islam in America. When Islamist groups like CAIR or the Muslim Public Affairs Council – which are used to controlling the microphone – cannot argue against the merits of Jasser's message, they quickly turn to vicious ad hominem attacks. A look at the home pages for CAIR, MPAC, the Islamic Society of North America (ISNA), the Muslim American Society and others shows plenty of blanket condemnations of the Boston attacks and statements that they do not represent Muslims. But no one has produced a detailed rebuttal to the ubiquitous online rhetoric that radicalized the Tsarnaevs and dozens of other young people. In a recent column, Canadian physician and writer Ali A. Rizvi, an atheist who left Islam, criticized what he called "the 'anything but jihad' brigade" which wants to consider every possible motivation for the Boston attacks and a disrupted terror plot in Canada, except for religious radicalism, despite what Tsarnaev told investigators. If terrorists say they were motivated by their interpretation of Islam, it should be openly discussed, Rizvi wrote. Doing so is not an indictment of all Muslims any more than saying "smoking is bad" is the same as saying "all smokers are bad." "Timothy McVeigh (also a terrorist by any definition of the word) didn't yell 'Jesus is great!' before carrying out the Oklahoma City bombing," Rizvi wrote. "His brand of terrorism wasn't linked to Christianity, because it wasn't carried out in the name of it. (In contrast, the bombing of abortion clinics is terrorism universally acknowledged as being linked with Christian religious extremism.)" Radical rhetoric is not shunned when it comes to other forms of political violence. When Jared Laughner killed six people and wounded 13 others, including U.S. Rep. Gabrielle Giffords, D-Ariz., in January 2011, media attention immediately turned to a political ad that featured crosshairs over various congressional districts, including Giffords'. Subsequent investigation, however, failed to turn up any political motivation for Laughner's madness. Similarly, when some Tea Party rallies drew people carrying arms, talking heads expressed concern that it posed an inherent risk of violence. Nobody tried to stifle those debates and, if they had merit, they would have been vigorously pursued. It should be no different when Muslims pursue political violence which they say is in furtherance of their religious beliefs. It's time to review the policy on politically correct language. When terrorists supported by Pakistan attacked Bombay in 26/11/2008, there were at least 2 Americans involved. Even before the attack, the CIA had an inkling that these 2 Americans were up no good. Yet neither then or now is there any indication from the US govt about handing these Americans to India to face trial. Along with many such incidences, it is clear that the US prefers to see the Jihadi problem with rose tinted glasses. CAIR is just taking advantage of this colored view. Lieberman cites the issue, ""The bombings "should again teach us that the enemy we face is violent Islamist extremism, not just al Qaida," said former U.S. Sen. Joe Lieberman." We must understand that 'aQ' is a brand name of only one franchise - only one of more than a few. Filing to understand we lose. We must be witting to the Muslim Brotherhood internationally; it goals and history, and it performers. That means we must be scrutinous of its subsidiaries; right down to those in our neighborhoods. It may take some study, nut aren't your children and grandchildren worth it?